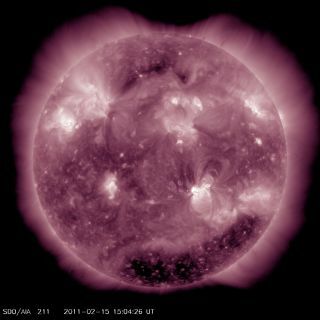 That's clearly starting to change, though, as evidenced by a class X solar flare – the strongest kind – that erupted from the sun Feb. 14. Space weather hasn't posed quite such a threat before, because during the last solar maximum, around 10 years ago, the world wasn't as dependent on satellite telecommunications, cell phones and global positioning system (GPS) – all technologies that could be disrupted by solar flares. "Please don’t panic," said Stephan Lechner of the Institute for the Protection and Security of the Citizen at the European Commission's Joint Research Centre. "Please don't leave the room and tell everybody that space weather will kill us tomorrow."